The town sprang up alongside the tracks of the Missouri, Kansas and Texas railroad. Originally named Sayers, the name was changed in 1889 when it applied for a post office and found that there was a community in Bexar County already using the name. The name Sayersville was granted by the postal authorities and the post office opened that same year. It was thought that Sayersville would grow as a cotton-processing facility but after 1913 a mine opened to process lignite coal. In Sayersville’s early days it showed every indication of prospering. Although early population figures are not available, the town was served by several stores and had a church and school. The 1920s were disastrous for the community. The marginally profitable cordwood market was eclipsed by natural gas and coal. Then the post office closed its doors in 1922. The coal mine caught fire in 1928, putting an end to that industry. In the 1930s the railroad discontinued passenger service to the community, but it managed to survive the Great Depression. The 1940 Census reported only two businesses supporting a population estimated at a mere 50 residents. Population figures stopped in the 1960s. 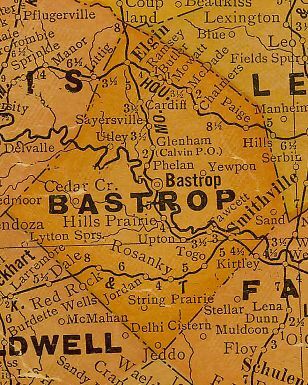 The Sayersville Historical Association of Bastrop has published a quarterly Bulletin since 1982 – a model for any small community wishing to preserve its local history.